The Burgman 650 Executive provides you an outstanding riding experience through an advanced transmission with two fully automatic modes (Drive and Power) plus optional manual shifting. A reliable and robust DOHC, liquid cooled engine utilizes design elements from the legendary Hayabusa to provide all the performance you’ll ever need – and then some. This urban smart and travel-ready scooter is equipped with spacious ergonomics, smooth suspension, and a plush seat with adjustable lumbar support, ample storage compartments, and an aerodynamically designed remotely adjustable windscreen. Additional amenities only available on the Executive model include heated grips for the rider, a supportive backrest for the passenger, and a heated seat for both the rider and the passenger. Telescopic front forks provide a sporty yet plush ride over a variety of road surfaces. 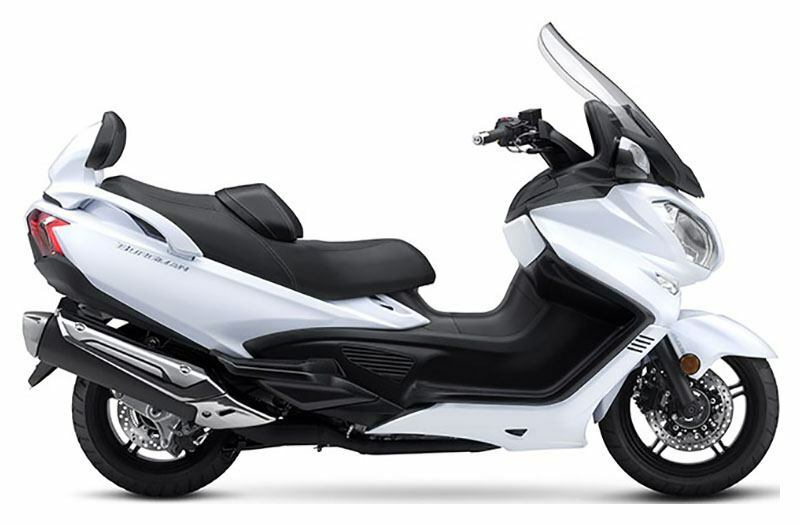 The twin-shock, swingarm style rear suspension has spring preload adjustment and contributes to the scooter’s impressive 1014 pounds GVWR rating. Front and rear disc brakes with ABS* deliver reassuring stopping power with adjustable controls to set both brake levers’ position to the rider’s preference. The dual front brakes feature ﬂoating discs to provide more consistent braking performance. A lever-operated parking lock provides extra peace of mind. The lever has a stylish design that makes it easier to reach and operate. 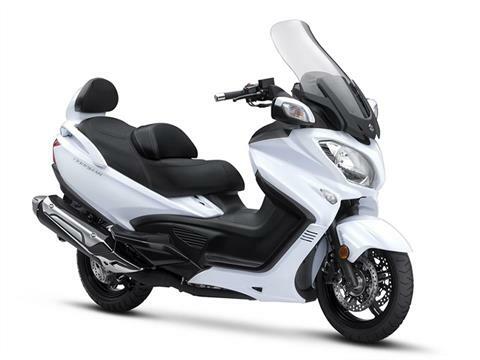 Lightweight, cast-aluminum wheels with a 14-inch rear tire and 15-inch front tire provide outstanding highway speed stability, good low-speed handling with a refined look. Majestic bodylines express power and agility, with contours that express the statement of quality and performance. The powered windscreen can be adjusted to suit the rider’s height, and powered mirrors can be retracted and extended at the touch of a button. The seat is optimally sized and thickly padded for two-up luxury even on long journeys. The rider’s backrest can be adjusted forward and backward by 50mm for optimal support. No tools are necessary. Pillion rider footrests provide comfort, letting the feel planted and relaxed, even during extended tours. The rear backrest firmly supports the passenger providing additional comfort and a sense of security. A flick of a switch activates an electric seat heater for both the rider and passenger. A cavernous, 50-litre under-seat compartment can hold two full-face helmets* and has a light for nighttime convenience. A cable lock allows you to secure a helmet outside the compartment to make space for luggage inside. *Helmet sizes and shapes vary, so helmets may not fit in the under-seat compartment. Three compartments below the handlebars provide space for maps and other items you might need on the road. Lower compartment can be locked and the other two are push-open types. One contains a DC outlet that’s ideal for charging a mobile telephone. The ignition switch fitted with a magnetic security cover that opens only with correctly coded key. Instrument cluster features a clean, refined look of quality. Large analogue dials for the speedometer and tachometer flank a digital display that shows an odometer, twin trip meters, a fuel consumption meter, a fuel meter, a coolant temperature indicator, a thermometer, a clock, an oil level indicator, an oil change indicator, a drive mode indicator (for drive mode and power mode), and a gear position indicator (for manual mode). *The eco drive indicator does not automatically improve fuel economy, but helps riders refine their riding habits to improve fuel consumption. Fuel consumption varies depending on traffic conditions, such as the frequency of starts from stop, distance driven, rate of acceleration (throttle use), chosen speed, and scooter condition. Slim, sharply styled multi-reﬂector headlights portray originality and sophistication in addition to providing outstanding illumination of the road ahead. Additional LED turn signals mounted in the rearview mirrors add to the scooter visibility to other drivers. New, black-finish brake levers match the rest of the high-quality controls. Twin cylinder, 638cc, liquid-cooled engine features a precise fuel-injection system and vibration-reducing dual counter balancer shafts that deliver a smooth and powerful riding experience. 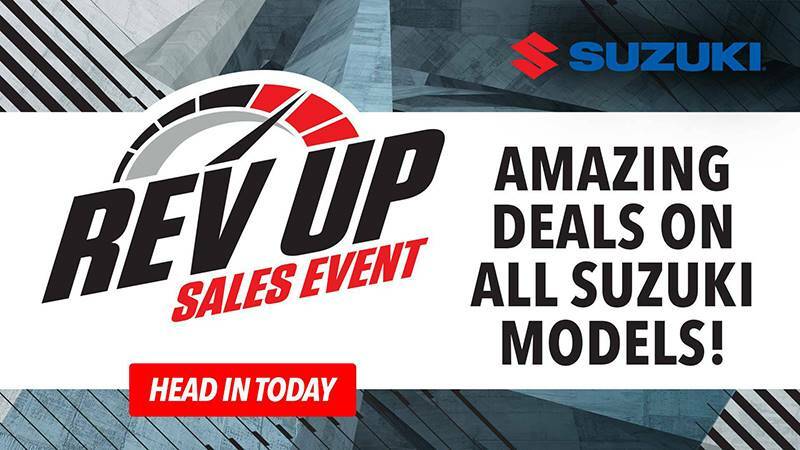 The Suzuki Fuel Injection system with O2 feedback plus the Pulsed-secondary AIR-injection (PAIR) system and catalyzer-equipped exhaust boost fuel efficiency and minimize emissions. The sleek exhaust system with stylish triangle-section muﬄer effectively control sounds. SECVT offers three modes: Two fully automatic CVT modes (Drive and Power) plus a Manual Shift mode controlled by a handlebar-mounted rocker button. Drive Mode - Provides superb fuel economy at normal road speeds while delivering a smooth and linear riding experience. Power Mode - Similar to Drive Mode, but provides more punch when you twist the throttle. Manual Shift Mode - Lets you thumb-toggle between six preset gear ratios for a unique feeling of control. 2.97 in. x 2.81 in.